Cantaloupe vines grow six to eight feet wide; previous seasons I have not had the space in my garden. This year, I sacrificed the ground behind the swing set and against the fence for the sprawling fruit. As of today, we have four nicely shaped cantaloupe! I say, as of today, because I may have spoiled them! You see, I was watering last week and got distracted (crazy, I know). The next day when I went out to water, I walked through a mushy backyard to discover I had left the water on for 24 hours!! (Yikes, not looking forward to the next water bill.) 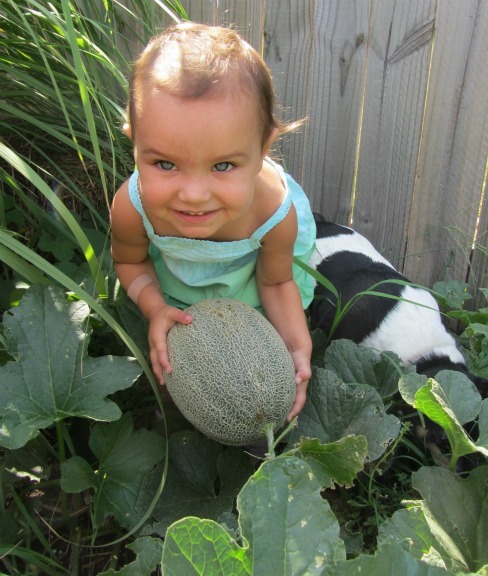 My K-State Extension publication on growing cantaloupe states, “Dry weather as the melons approach maturity is important to maintain good vine vigor and sweet flavorful fruit.” Hopefully my mistake does not ruin the taste of the melons. I’m eager to cut into one but must wait until the stem slips easily and cleanly from the end of the melon. They have been a great addition to our garden and relatively easy to grow. When I set out the transplants, I used a liquid starter fertilizer. It puts the nutrients where the small rootball can absorb the much needed N, P, and K. My soil had all the nutrients the plant needed but the little transplant root ball wasn’t able to absorb those nutrients until its roots branched out into the soil. Once the vines had spread out, I side dressed with a 21-0-0 fertilizer. The melon needs more nitrogen than phosphorus and potassium. We are just days away from eating our cantaloupe. It’s a great snack for my girls. A quarter slice has approximately 50 calories and a great source of vitamins A and C. My fingers are crossed, I sure hope my distraction didn’t ruin our sweet tasting melon.